We went through WAY too many batteries with Lucy's baby swing, so with Jr coming, we explored the option of converting it from battery operated to a plug-in. Sure enough, my friend's brother had done this with a swing and sure enough, my amazing husband figured out how to do it with our swing! Oh the money we will be saving!!! The directions are below if you're interested . 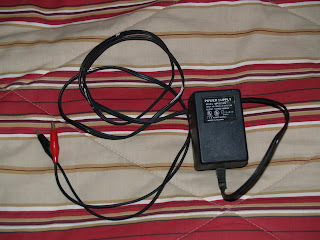 . . To plug in your swing you'll need to make an AC adapter like the one in the picture below. Find an old one you don't use, or go to Radio Shack and just buy a generic one. Match it as close as possible to the volts put out by the total of the batteries, or slightly higher (probably around 9 or 12). Cut off the round plug end, strip the wires about a half inch, and crimp on two of the aligator clips like the ones in the picture, again, from radio shack. The wire with the stripe or the writing is usually the negative one (black). Then open up the battery compartment on the swing and find where the wires connect to the springs, or whatever the metal parts are in there and connect the red to the positive and the black to the negative. You might have to experiment to figure exactly where to connect them, so turn it on and move the leads around until it works. That's cool! I didn't know you could do that...good luck with the birth of your little boy! This is by far THE MOST helpful tip ever. We've been wanting to figure out a way to do this, so now we will be well prepared when #3 hits in July. Good luck with your little guy - He's so blessed to have you as a mommmy! And in her 18th month . . .
And THEN I go to sleep . . . .
My how time flies . . . I'm Famous . . .
What Dad does at IKEA to keep me happy . . .
Kind of a big deal . . .